The welded design offers higher structural resistance. For longer life, the hood is 40 percent thicker than the hood used on discontinued 16A Flail Chopper. 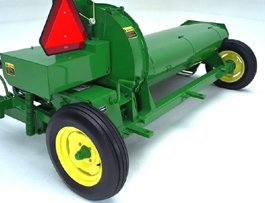 The left-hand support is used to attach the wagon during operation, while the right-hand support is used to hook the wagon during transport when it is necessary to have it in line with the chopper and the tractor. Two wheels with 5.90x15 4 PR tires are included as standard equipment. Changing the wheels and tires is a very simple operation. The square axle of the chopper has jackstand supports that help when changing the tires. 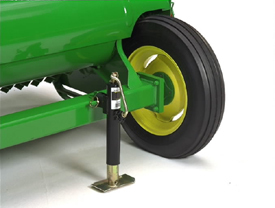 With the chopper hooked up to the tractor, the jackstand can be placed on either support, left or right, as required. 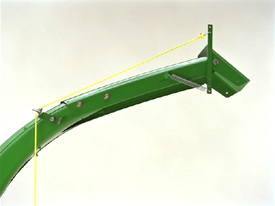 The cutting height can be adjusted to obtain a minimum of 64 mm (2.5 in.) or a maximum of 184 mm (7.25 in.) with a lever or an optional hydraulic cylinder. The mounting system of the knives allows them to swing back when they hit stones or other obstacles and to automatically return to their normal position without interrupting the chopping operation. The rotor has 42 heat-treated knives. They are double edged so they can be reversed, increasing their longevity. 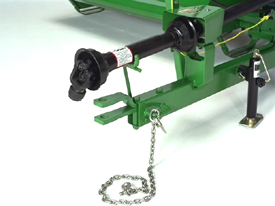 The hitch is Category 2, with hitch plates attached by bolts and bushings. The tongue is made of 3-in. x 5-in. PTR for higher strength. 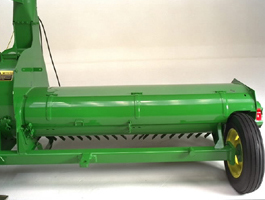 The tongue can be adjusted from the tractor seat. 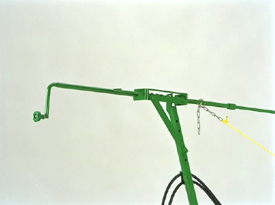 A screw-type jack makes hitching up the 972 Flail Chopper fast and easy. 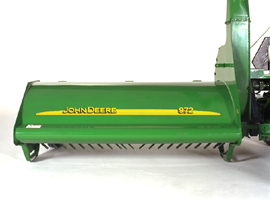 Lower initial costs and simple, rugged construction make the 972 easy to buy and maintain. 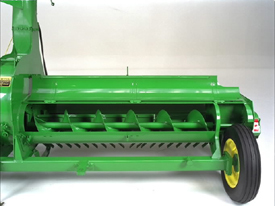 The speed of the auger is 300 rpm, which provides better delivery of material into the cutterhead. 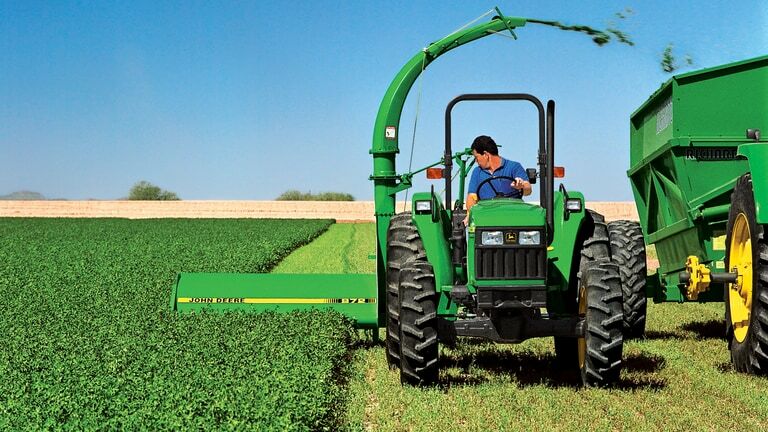 The design of the door allows easy access to the auger. There are three reinforced hinges to prevent breakage. For increased convenience, a cover over the chain on the right-hand side can be removed when service is necessary. Three rotary knives are included in the cutterhead as base equipment, and a set of three additional rotary knives can be ordered. Knives are adjustable to provide longer life. 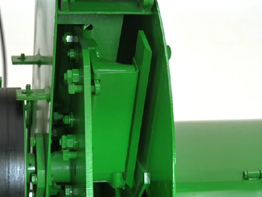 Three fan blades and three fan plates located between the knife supports are installed to increase the efficiency of forage ejection. The lower side of the cutterhead has 56 percent thicker steel than the 16A cutterhead for longer life. Its improved design allows easy installation and removal. 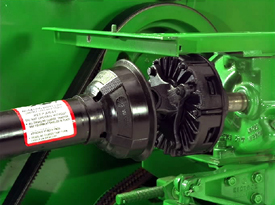 The discharge spout mechanism allows the operator to easily adjust the direction in which the forage is thrown and, at the same time, adjust the speed at which the material is being ejected. The material deflector has independent movement from the rotation lever and is adjustable for different positions. The spout mechanism is heat-treated, which ensures a longer life of its components. The spout rotation is done through a lever, within reach of the operator from the tractor. A steel wear sleeve (attachment) extends the life of the spout. The vertical and horizontal extensions (attachments) evenly fill the larger or taller wagons. The slip clutch is designed to protect the components of the drive system of the chopper. The slip clutch releases the load and reengages automatically, protecting the components when there is an overload or obstruction, avoiding damage to or breakage of the chopper parts. 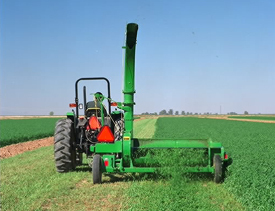 Overrunning the clutch, integral with the slip clutch, releases the rotating parts, disconnecting the tractor power take-off.